Is Steve Bannon the second most powerful man in the world? The question was posed by Time magazine back in February, when it placed the then White House chief strategist on its coveted cover. 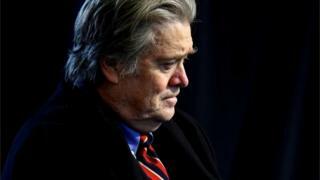 Bannon was said to be Donald Trump's alter ago, a Svengali-like figure whose fingerprints were everywhere: from the fiercely nationalistic "American carnage" inaugural address to the decision to leave the Paris Climate Change Agreement, from the botched travel ban to the White House onslaught against the "fake media" - who Bannon memorably labelled "the opposition party." His crumpled appearance was a form of power dressing. He was said to be the only West Wing adviser allowed into the Oval Office without a suit and tie. He was also the fiercest proponent of the "Let Trump be Trump" doctrine, an unbending approach which the chief campaign strategist believed had won the billionaire the White House. The cover of Time magazine showed Bannon at the height of his powers, but it may also have set in motion his eventual downfall. The magazine labelled him "The Great Manipulator", a description that reportedly "annoyed" Donald Trump - a president not used to sharing the limelight and unaccustomed to being cast as a puppet. In the court of Donald Trump, there would be no powers behind the throne. In the warring West Wing, which often makes Game of Thrones look like a Sunday school outing, Bannon became the most aggressive combatant. At least until the arrival of the short-lived Anthony Scaramucci, whose personal feud with Bannon produced the most memorable (and unprintable) insult ever uttered on the record by a White House aide. On his enemies list were Trump advisers he derided as "globalists" - the president's daughter Ivanka Trump, her husband Jared Kushner, the National Security Advisor H.R. McMaster, the deputy national security adviser Dina Powell and the national economics adviser Gary Cohn. In early April, the New York Times reported that relations between Bannon and Kushner had reached the "point of breakdown", without any hope of reconciliation. "Here's the reason there's no middle ground," Mr Bannon reportedly told the president's influential son-in-law. "You're a Democrat." To Bannon, the globalists obstructed his beloved America First agenda. They were dangerously moderate, metropolitan liberals who did not truly want Trump to be Trump. During this power struggle, Bannon had formed an improbable relationship of convenience with Reince Preibus, a member of the Republican establishment and the first White House chief of staff. However, when Preibus was replaced as chief of staff by the former marine general John Kelly it looked as if Bannon would soon be shown the door. One wonders now how long Bannon allies like the presidential adviser Sebastian Gorka will now survive. Bannon will return to Breitbart News, a right-wing favoured source of news and views for many of Donald Trump's most loyal, red-capped supporters. Journalists close to Bannon believe he will not necessarily turn his Breitbart firepower on Donald Trump, but rather the "globalists". Jonathan Swan of Axios reports the website will go "thermonuclear" against "globalists". Bannon has also apparently told associates he will turn the website into "a killing machine". As Maggie Haberman, the New York Times' impeccably-sourced White House reporter notes: "Bannon is much more of a problem for the White House staff from the outside than inside it." Many of Trump's most diehard supporters will doubtless see his departure as a betrayal, a breach of faith. The administration's most powerful nationalist no longer occupies a West Wing office. A Bannon-less White House will produce a Trump-lite White House. Who is left behind to urge Trump to be Trump? Joel B. Pollak, a senior editor at Breitbart, reacted to the news of Bannon's exit with a one-word tweet: "#WAR." Then he penned a rapid response column, warning: "It may turn out to be the beginning of the end for the Trump administration." Bannon himself evidently takes a different view. Following his resignation, he told his biographer Joshua Green: "If there's any confusion out there, let me clear it up: I'm leaving the White House and going to war for Trump against his opponents - on Capitol Hill, in the media and in corporate America." Trump doubtless believes that he can still rely on the loyalty of the Bannon right. His tweets often seem aimed squarely at those people. But Bannon helped amplify his nativist messaging. He was the president's most influential hard right guarantor, a key emissary to his most admiring and energised constituency. Bannon leaves at the end of the most overtly nationalist few days of the Trump presidency. Another irony is that it was Bannon who labelled the white supremacists "a collection of clowns" - precisely the sort of language that many mainstream Republicans hoped the president himself would use. Steve Bannon will no longer be cast as the second most powerful man in the world, or America, or Washington. But he arguably remains the most influential figure on the insurgent right, a constituency that Donald Trump is reliant upon for a second term in the White House.